Whew! We've been busy! As Niels mentioned in the previous post, we just opened up our home this past weekend for our builder's fall tour. There's nothing like knowing a bunch of people will be walking around your home to motivate you to complete projects and cut through clutter! I have grand plans to update the house tour and show you what's been keeping us busy (other than an energetic three-year-old and very social seventeen-year-old). I'll kick things off with my latest green clean project: Wool dryer balls! A friend told me about these as an earth-friendly alternative to dryer sheets. In addition to making clothes cozy and soft without the yucky chemicals, they are also known to reduce drying time, which saves money. We haven't used dryer sheets for several years, but I'm curious to see how well they help with our drying time. They don't cut down on static, but since we started using 1/2 cup vinegar in each wash load, that's been a non-issue for us. 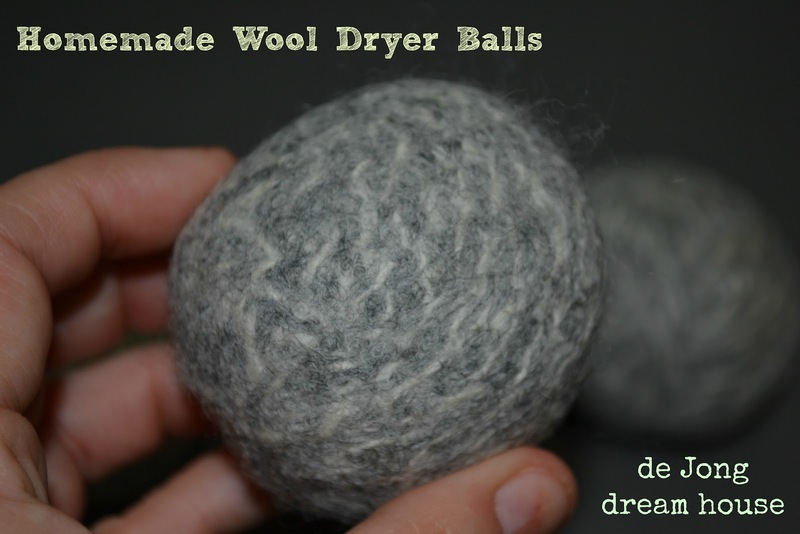 You can buy wool dryer balls on etsy and Amazon, but they are easy to make, fairly inexpensive, and kind of fun. It only takes about fifteen to make the balls. The felting process, where the fibers fuse together, takes a tumble in the washer and dryer. All you need to get started is a skein of 100% wool (or any other animal fiber, such as alpaca). You don't want to use any synthetic yarn because it won't felt properly. I bought this skein from Joann's. I forgot to bring a coupon, so it was $6. I asked a nice granny-type to help me find the 100% wool options. Start by wrapping the wool around your hand about twenty times. Pull the wool off your hand and wrap around the center another twenty times. Next, fold the two ends together. Start wrapping the wool again and you'll soon have a little ball. Continue wrapping until your ball is about the size of a tennis ball. I stopped when the ball fit comfortably in my hand. The balls will shrink with use, but this is a good starting size. Cut the wool and tuck the end under a loop. I ended up with four balls from my skein. Next time, I think I'll plan to make three slightly larger balls. Next, you can recycle an old nylon for the felting process. Put a ball in the nylon and tie off with a piece of ribbon. Repeat until all the balls are tied in the nylon. Throw the balls in the wash on the highest heat setting. The balls will be smaller after they are washed. Finally, toss them in the dryer on your hottest setting. I didn't noticed much difference in size after the dryer. The finished project! You can see how the fibers have started to fuse together (felting). This will continue with each wash.
We've been scentless for awhile,but I thought it might be nice to use some essential oils for a subtle fragrance. I love lemongrass. Other options might be lavender, vanilla, lemon, or orange. I dabbed about 15 drops of essential oil directly on the balls. I've since made more balls for our other laundry room (yes, we have a washer and dryer on each floor). With the second batch, I dabs 3-4 drops every so often as I was rolling the balls. I'm repurposing this little basket to store the wool balls. I will be making more soon! I've heard that you should use anywhere from 3-6 balls at a time. To use, just throw them in dryer with your wet clothes. I've now used the dryer balls for two loads. I can't speak to the savings in time to dry because our dryer uses a sensor and I'm usually nowhere near the laundry room when it's on (either I'm sleeping at night or downstairs during the day). But, I can definitely tell the difference with how soft our clothes are now. We haven't used dryer sheets for almost four years so I forgot all soft and cozy clothes can feel. I am SOLD! I am also addicted to making these balls so my family can expect to receive them for Christmas! I have never heard about wool balls. I'll have to try this!! lol...thank you :-) Part of the reason I started blogging was because I always forgot how I made something and wanted to keep a record. I had to take pictures of each step. To answer your question, yes, washing/drying the balls in the nylon is how you felt (or fuse) the wool. Using the nylons keeps them from fusing together!